Matsushita Electric Industrial Co. and Sony Corp. unveiled new digital cameras Tuesday that will go on sale next month in a bid to get out in front of the pack amid intensifying competition. Sold under the Panasonic brand, Matsushita’s Lumix FX01 features a 28 mm wide-angle Leica lens. The 6-megapixel camera, weighing 160 grams, is the world’s smallest that can handle that type of wide-angle lens, the company said. Another Matsushita model, the TZ1, boasts a 10× optical Leica lens. The 5-megapixel camera features an automatic mode with a maximum sensitivity of ISO 1600, which allows a faster shutter speed and enables users to take pictures in dim lighting. The FX01 is expected to retail for around 48,000 yen when it is released March 10, while the TZ1 will probably go for around 45,000 yen when it hits stores March 24, according to the firm. Sony said it will release a new model in its Cyber-shot digital lineup March 10. The W30, likely to be priced at around 30,000 yen, is positioned as an entry-level model, and the firm said it boasts features designed for beginners. For those unfamiliar with icon menus on the control panel, text explanations will also be shown, the company said. 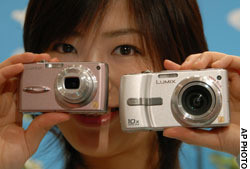 Despite its entry-level status, the model features 6-megapixel CCD and a Carl Zeiss lens, the company said. Matsushita and Sony are relatively new forces in the camera industry, where the landscape has been redrawn amid rapid digitization. Since its entry into digital cameras in 2001, Matsushita has been expanding its presence with the popular Lumix brand, which boasts an optical image stabilizer. 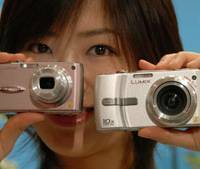 The Osaka-based maker plans to sell 8 million digital cameras globally for fiscal 2006, double the figure for the current fiscal year. Sony has become a global digital camera giant with its Cyber-shot cameras, competing with traditional powerhouse Canon Inc. for the world’s top position. Regardless, all digital camera makers are facing a fierce battle for survival as the market approaches maturity. According to the trade group Camera and Imaging Products Association, total digital camera shipments rose 8.4 percent year-on-year in 2005 to 64.77 million units. The association projects 4 percent growth in 2006, to be followed by a 2 percent increase in 2007 and 0.8 percent in 2008.